The following discussion comes from 1884 seventh edition of Félix-Archimède Pouchet's The Universe; or, the Infinitely Great and the Infinitely Little (1870). This layman's guide to natural science became infamous for Pouchet's disparaging references to Pasteur's germ theory and for the atomic theory of matter. 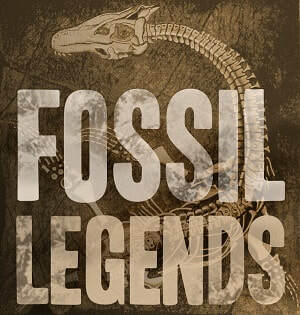 In the following passage Pouchet discusses how fossils were taken as evidence of the supernatural. Yet in spite of this marvellous preservation of ancient beings, men long persisted in regarding fossils as only freaks of nature, lusus naturae, as they were called. In vain did the earth yield up its most delicate skeletons with all their fine, thin bones; in vain did it present shells with their most charming tracery, sometimes even with their ancient colouring; in vain did we find in the midst of rocks birds yet enveloped in their feathers, and insects with their transparent wings; up to the sixteenth century all these things only passed for accidental products begotten by chance, and merely possessing the deceptive appearance of beings which life had animated. No slight trouble had to be taken in order to hammer the truth into the refractory brains of some savants. The first who had the courage to do this was a potter, poor in fortune but great in genius. It was Bernard Palissy who in his lowly state taught a lesson to the doctors of Paris, and showed them that the shells which are found in the soil were carried thither by the sea, which of old occupied the place where we find them. It was this humble and fervent man who thus became the founder of positive geology. But whilst the different fossiliferous rocks were being deposited, whilst the earth was renewing its living races, plutonic forces, in ceaseless agitation, from time to time shook the crust of the globe, or fractured it in various places. Its fragments formed our mountains, and these, issuing from the depths of the seas, bore aloft to the regions of the clouds the charnel-houses of the animals which had formerly peopled their abysses. When Buffon in his turn came to the support of the view that the shells scattered over the summits of the Alps and Apennines only proved that the globe had undergone convulsions, he found himself contradicted where no person could have expected it. This was by Voltaire, who in his Physique attacked with biting sarcasm those who adopted this opinion. He maintained that all the shells found on our mountains had been scattered there by pilgrims on their return from Rome. Only a few words were needed to have silenced the immortal writer, but these few words Buffon never uttered. He could have told him that we find these fossil vestiges everywhere, even in the two Americas, whither certainly these pious travellers never carried them, whilst, on the other hand, there are even imposing chains of mountains which are absolutely formed of shells. Notwithstanding the perfect preservation of many fossils, the love of the marvellous which predominated over our ancestors made them misunderstand nature, and these relics were almost constantly assigned to some extraordinary creature or other. The bones of bears, which were obtained from the caves of Franconia, passed in Germany for a sovereign antidote, and were sold in all the apothecaries' shops as the remains of the fabulous unicorn. For the elephants and mastodons there was generally another story. As many of the bones of these animals present in their forms striking resemblances to those of man, at an epoch when the imagination of our forefathers, roused to enthusiasm by the legends of olden times, elevated the stature of heroes to the height of their heroic poems, the bones of the great mammals found in the earth were constantly referred to some celebrated personage. Thus, according to the statement of Pausanias, the knee-cap of an elephant, as large as a circus discus, found near Salamis, was considered as having belonged to Ajax. The Spartans prostrated themselves before the skeleton of one of these animals, in which they thought they recognized the skeleton of Orestes. Some remains of a mammoth found in Sicily were considered as having belonged to Polyphemus! . . . The learned were not more exempt than the vulgar from these kinds of errors. Father Kircher, in his remarkable work on the subterranean world (Mundus Subterraneus), gives figures of these giants alongside of men of ordinary size. The skeleton of an elephant discovered in Switzerland, at the foot of a tree torn up by the wind, was considered by F. Plater, the anatomist, as the skeleton of a giant nineteen feet high. He even restored it by means of a sketch which became celebrated, and which was to be seen some time ago at Lucerne in an ancient college of the Jesuits. In the reign of Louis XIII. there was found on the banks of the Rhone a skeleton which attained great celebrity. It was shown as that of Teutobocchus, defeated by Marius in a most sanguinary struggle. It was said to have been exhumed from a tomb bearing this inscription, "Teutobocchus rex:" in which were also found some medals with the same title. But despite all this evidence, the remains of this too famous king of the Cimbri, which gave rise to so many bitter disputes among the faculty and physicians of Paris, were recognized by De Blainville as being nothing more than those of a narrow-toothed mastodon (M. angustidens). The name of the Field of Giants is even often given to places in which the bones of elephants and mastodons abound.